We had such a blast reading all your brilliant ideas for our Wild Moose Chase pattern. They kept us laughing for days and next time we have a deadline that permits it, we are absolutely holding another naming contest! We went to both Sew Expo in Puyallup, WA and Quilt Festival in Houston, TX this year. Figuring out how to ship a pallet full of product was a big accomplish for us! We have a few more retail shows scheduled for 2019. This was a big step for us. We decided to start carrying our favorite notions, tools and a few fabric bundles. We are loving having a little something to go with our patterns and hardware. It has been so much fun for me to see what you guys are creating with Foundation. Good Vibes Only, my second line, will be out this year and I can’t wait to see what y’all make! This was the first year we traveled to different guilds around the US to give lectures and teach our patterns. We will be doing less of this in 2019 because of our schedule but it was an amazing experience! Learning all about this sustainable resource and sourcing a bunch of fun new colors to sell and play with has been a load of work, but quite rewarding. We love sewing with cork and hope you do too! 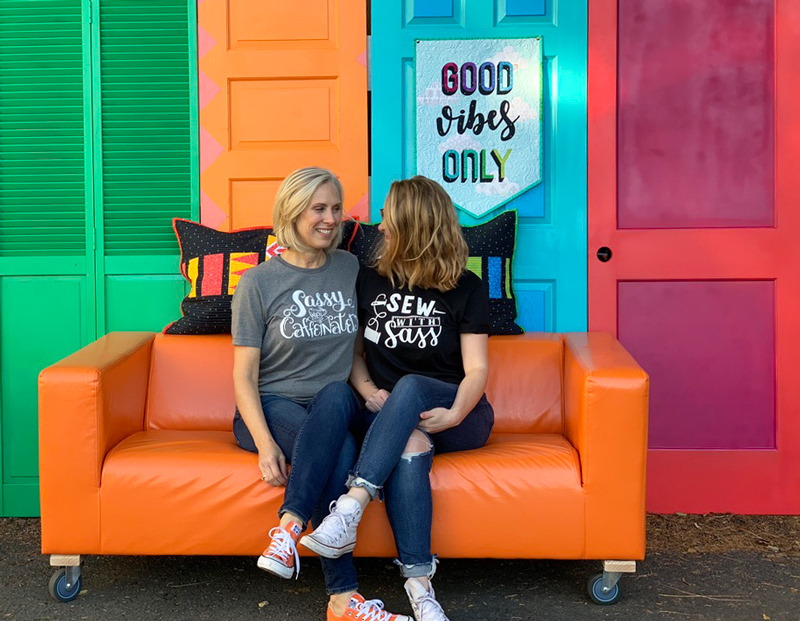 Printing our Sassy sayings onto t-shirts to sell has been a goal of ours for years and we finally did it! With lots of help from our unpaid intern (my dad!) we turned our living room into a print shop. I know this is a total tease, but we can’t quite share all the details yet! Right before I left for Spain, we sewed up a ton of great projects and held a photoshoot in Kristy’s cul-de-sac with a couple of my young cousins. It was a blast! In addition to all that, we still managed to publish 6 new patterns - the Quick Corky Wallet, Finley’s Farm, Elm Street Bag, Jolly Lane, Express Yourself Way and Wild Moose Chase. Plus we revamped some of our older favorites! Now, what’s next? 2019 is already shaping up to be a busy and exciting year. 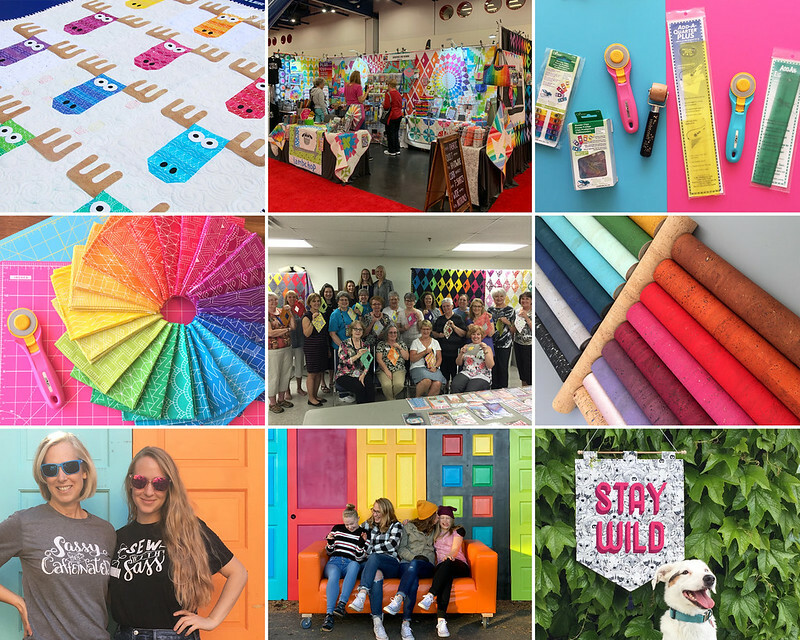 We have a few events already scheduled, a fabric line coming out, a new book on the way (for Spring), a few new patterns already in the works and lots of new products we are pretty jazzed about! We really want to extend a big thank you to each and every one of you following along on our journey and sewing our patterns. We really couldn’t do what we love without you. THANK YOU!! We hope you all had a wonderful holiday season with loved ones and are ready to get creating in 2019 with us!